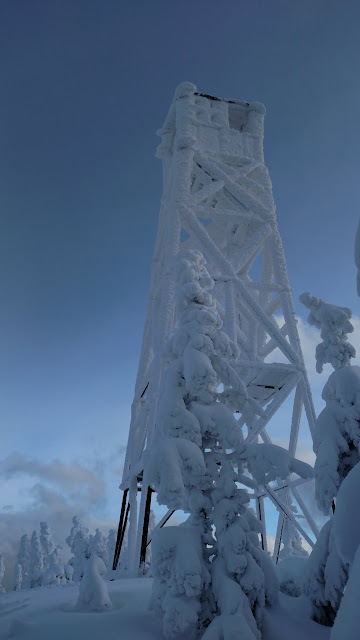 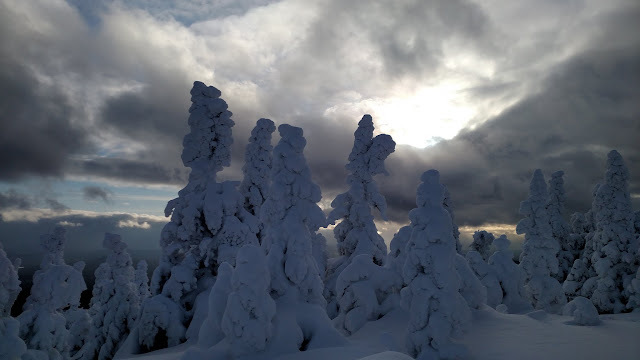 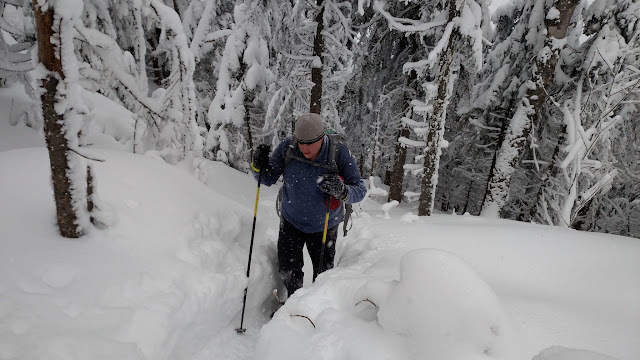 Today I went in search of some good conditions for a little cross country skiing. 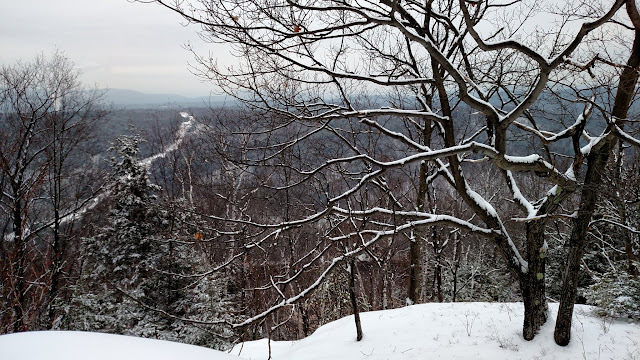 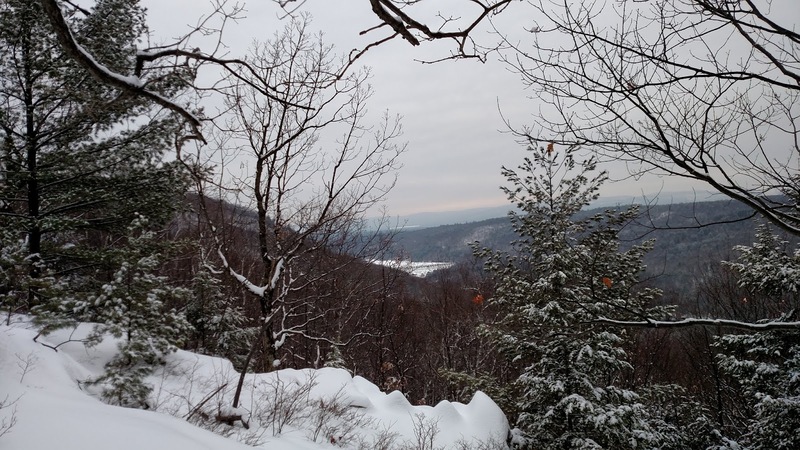 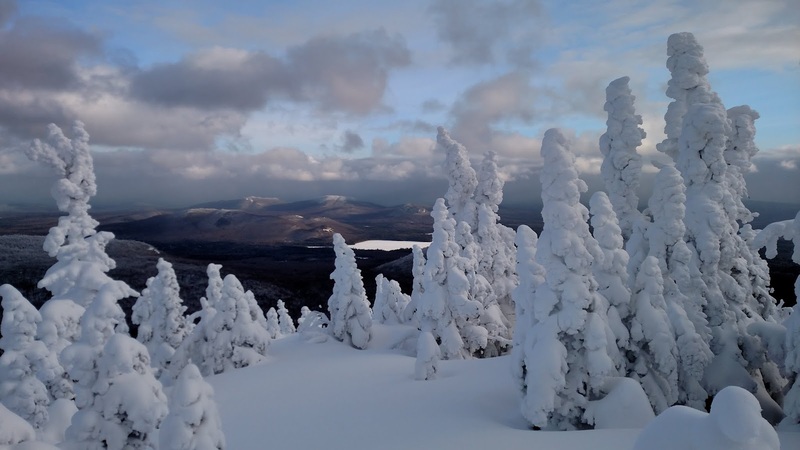 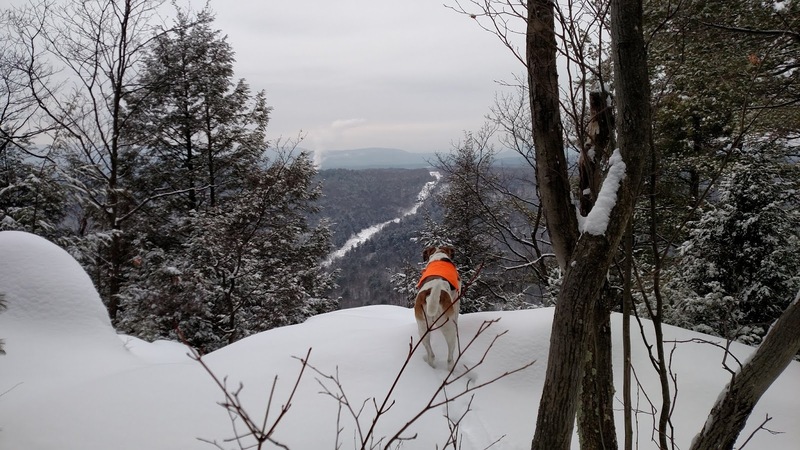 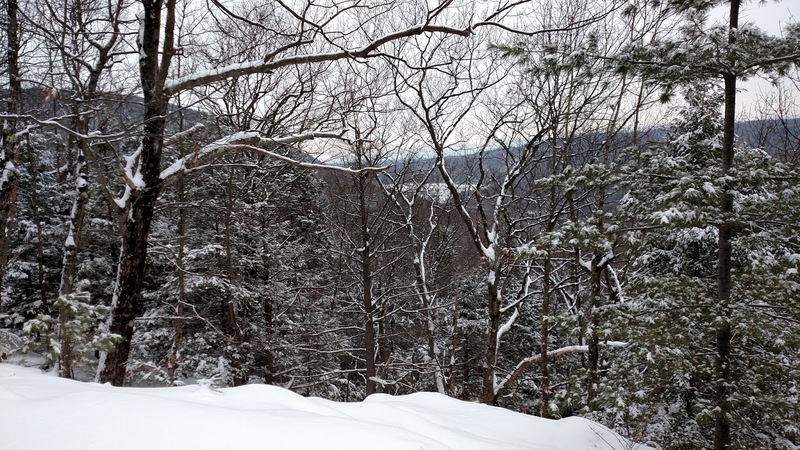 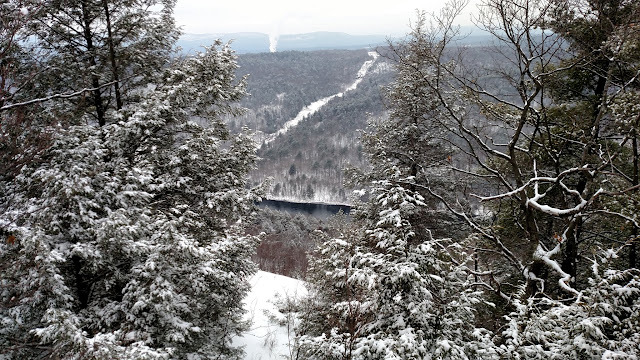 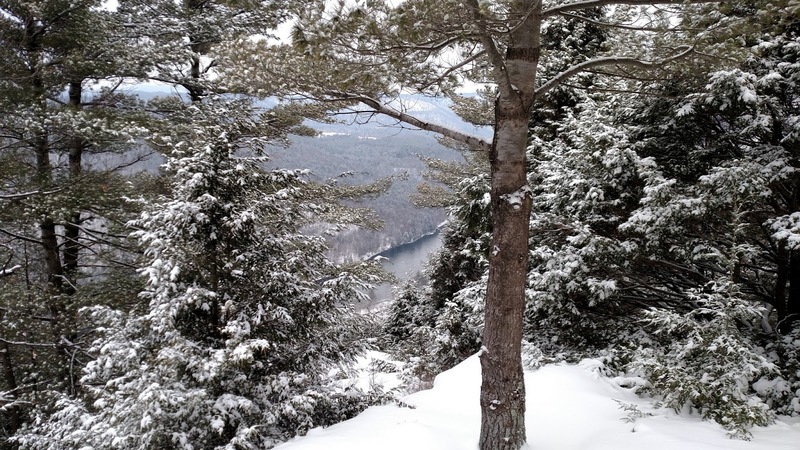 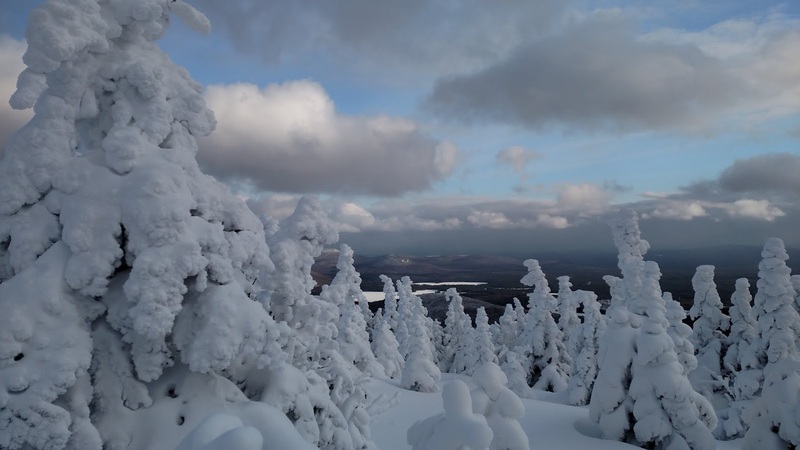 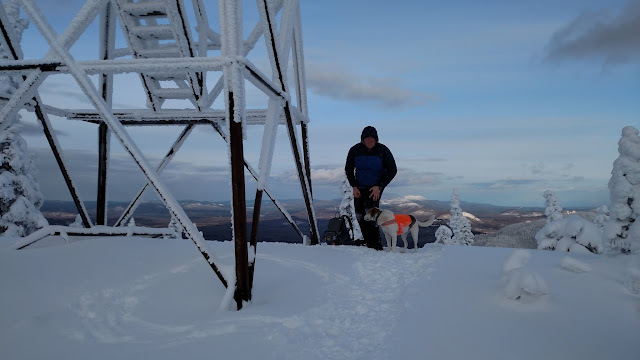 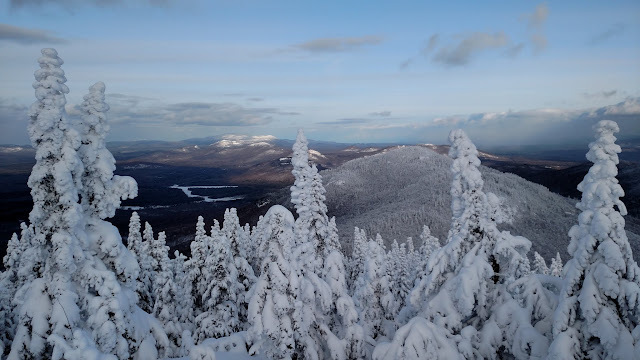 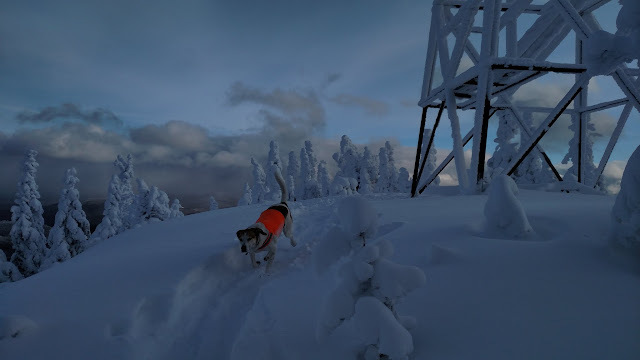 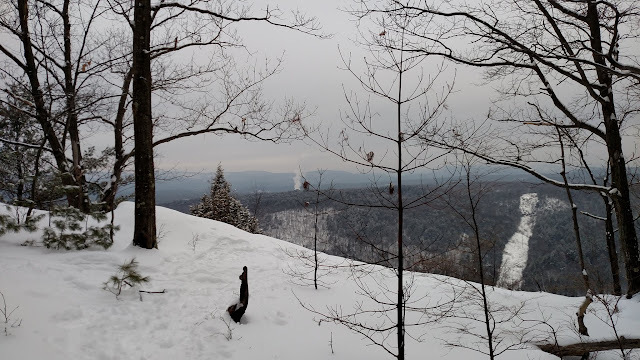 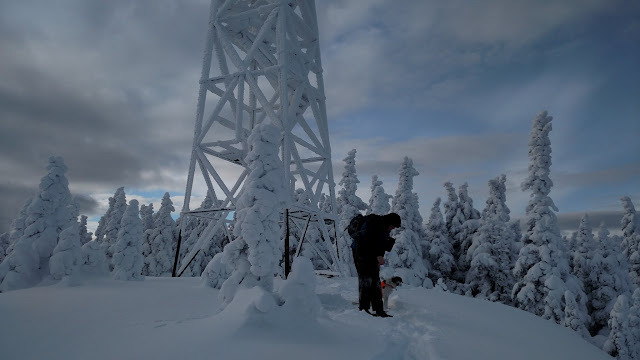 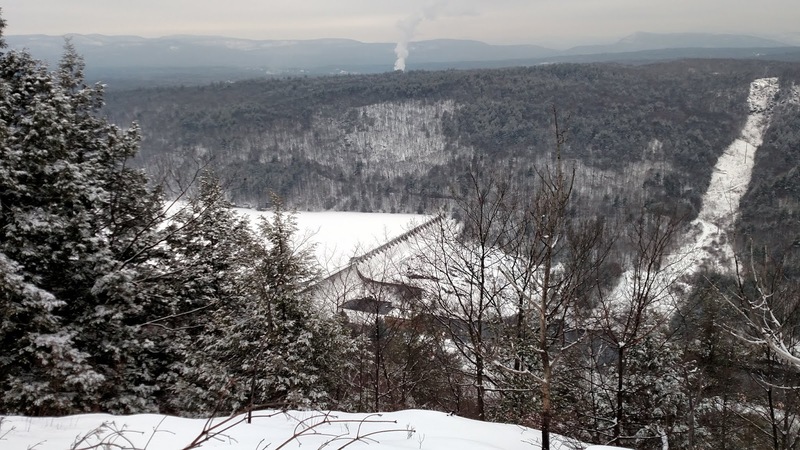 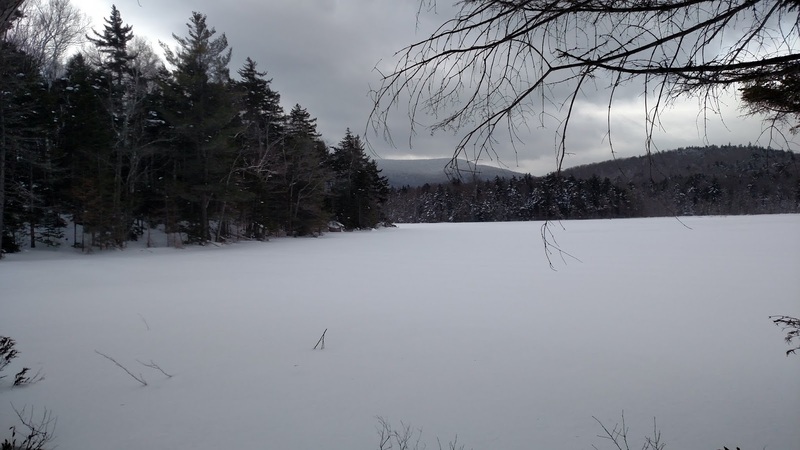 I headed west towards Indian Lake, knowing that I would find more snow out that way than in the southeastern adirondacks. 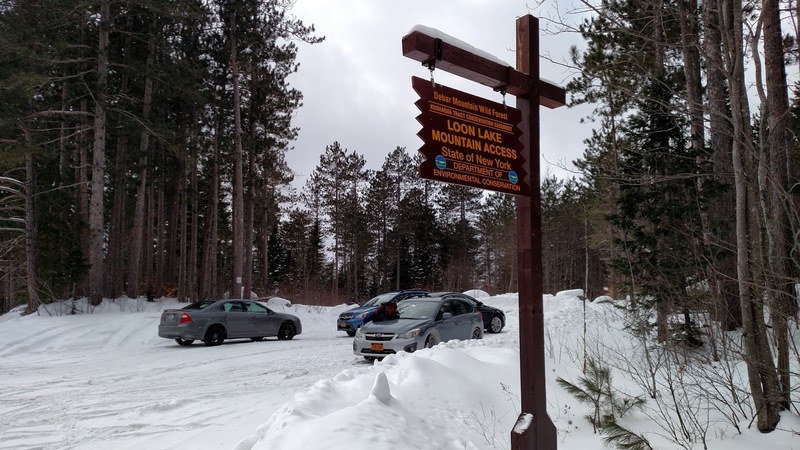 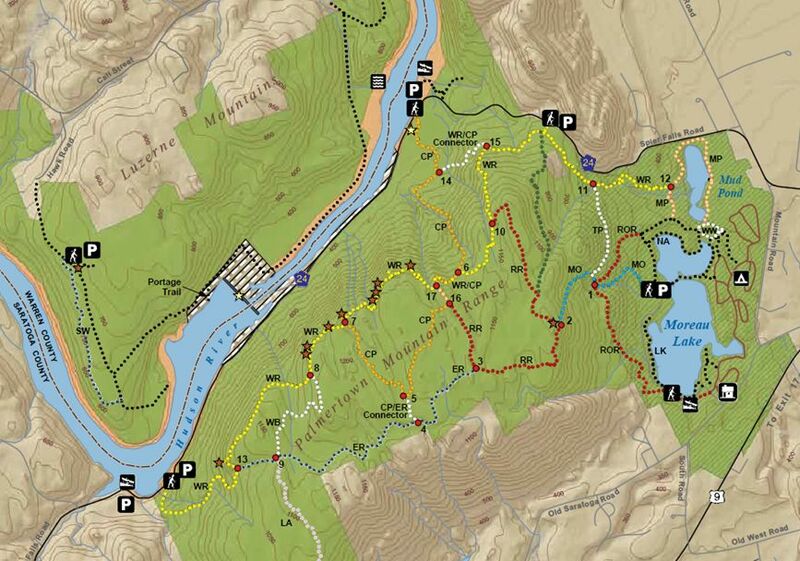 I settled on parking at the large pulloff near Lake Durant where the Northville-Placid trail crosses Route 28. Rather than ski north towards Tirrell Pond, I went south towards Stephens Pond and Cascade Pond. 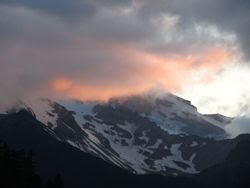 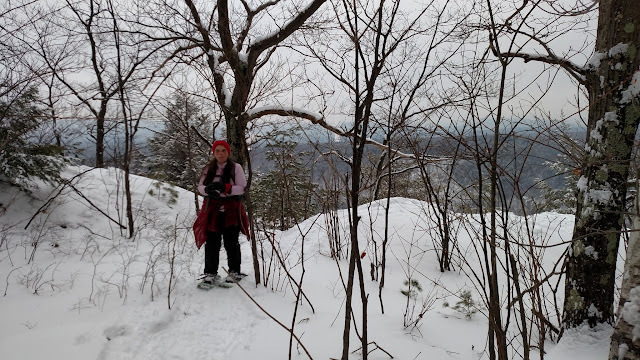 I had just skied to Stephens back on January 7th, but Cascade would be a new destination for me. That being the case, I skied that direction first. 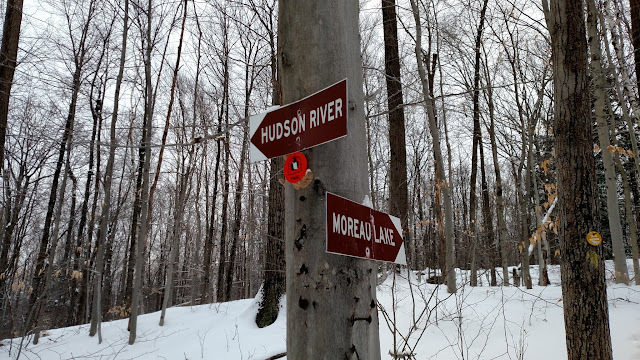 The sign-in register is quite a ways in on the trail. 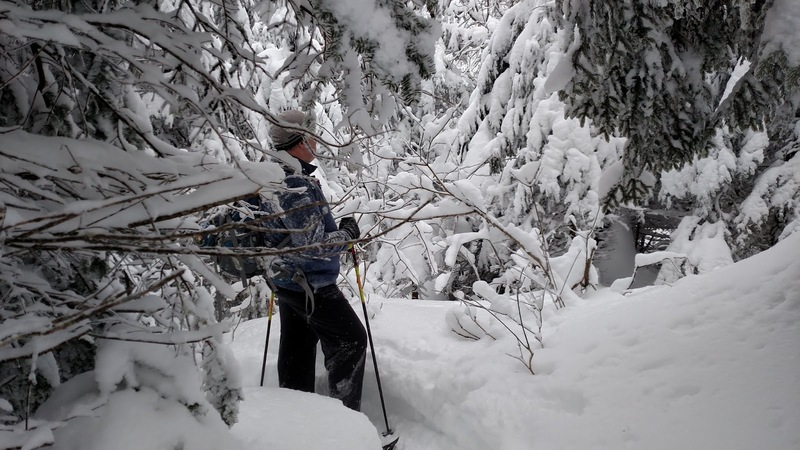 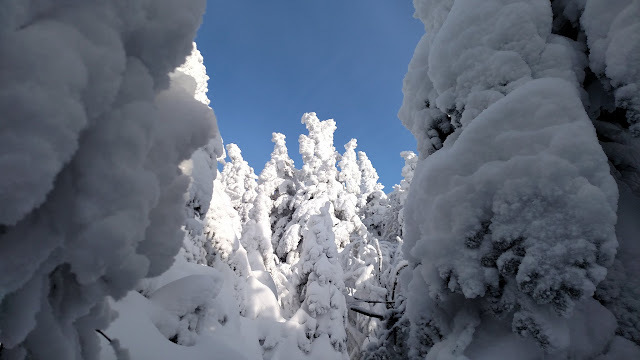 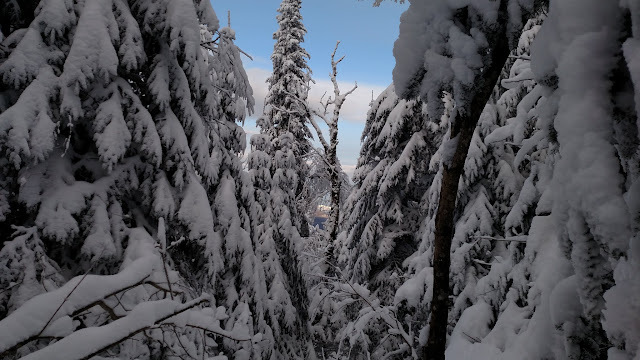 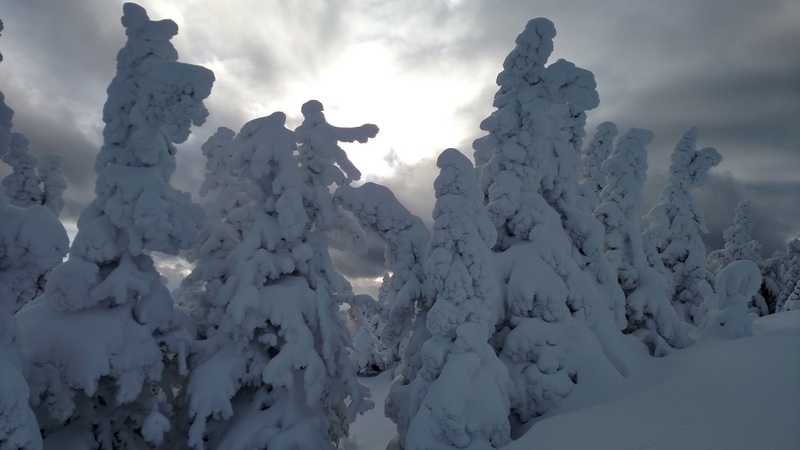 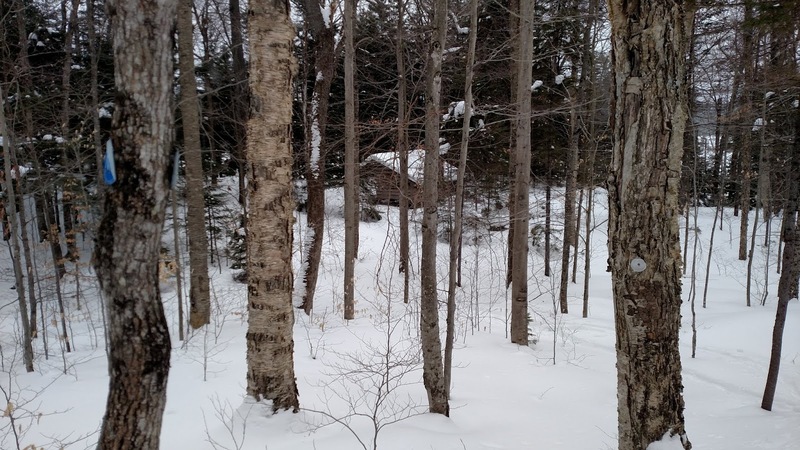 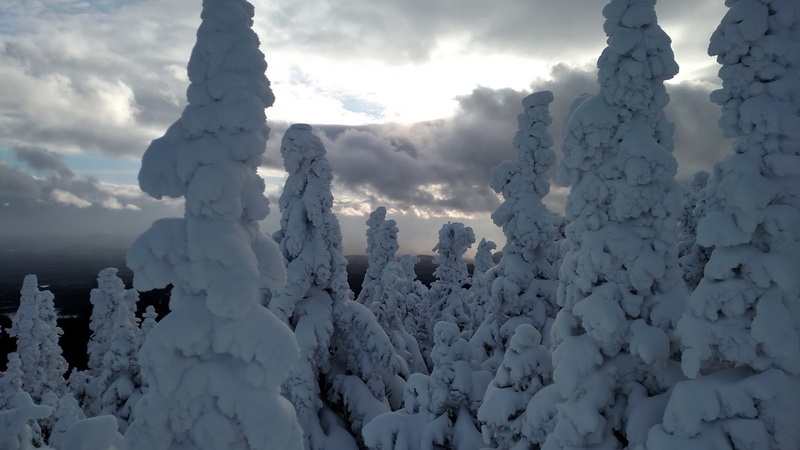 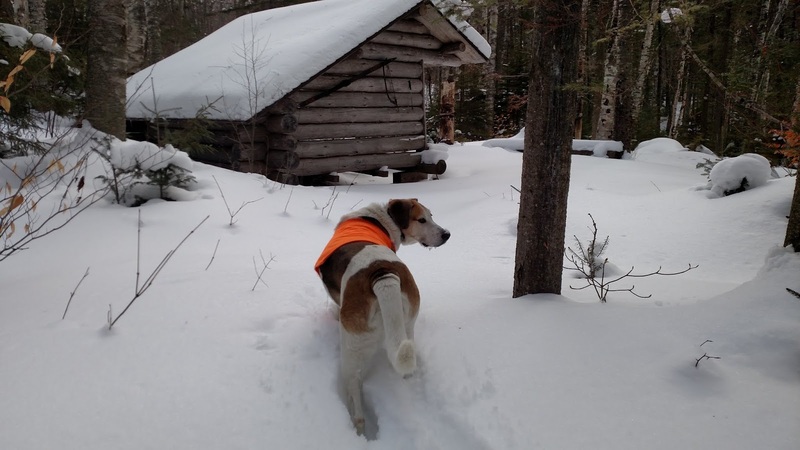 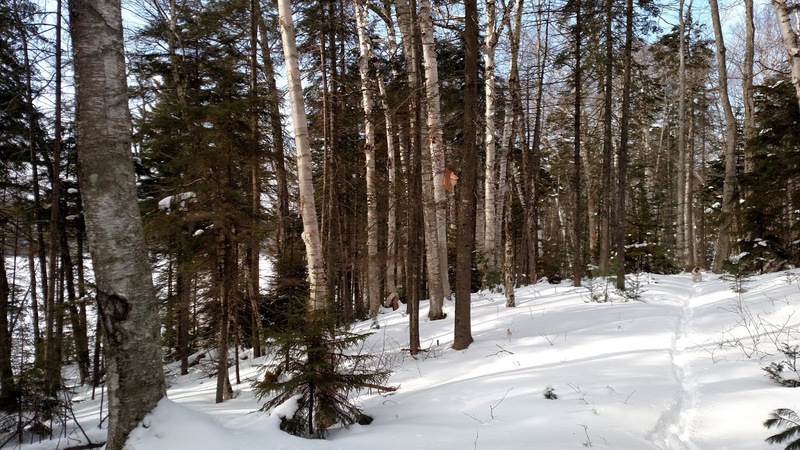 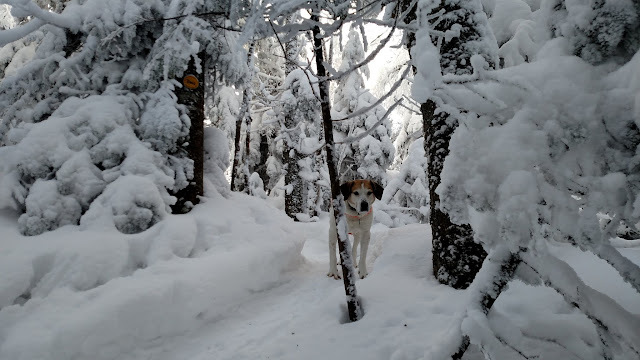 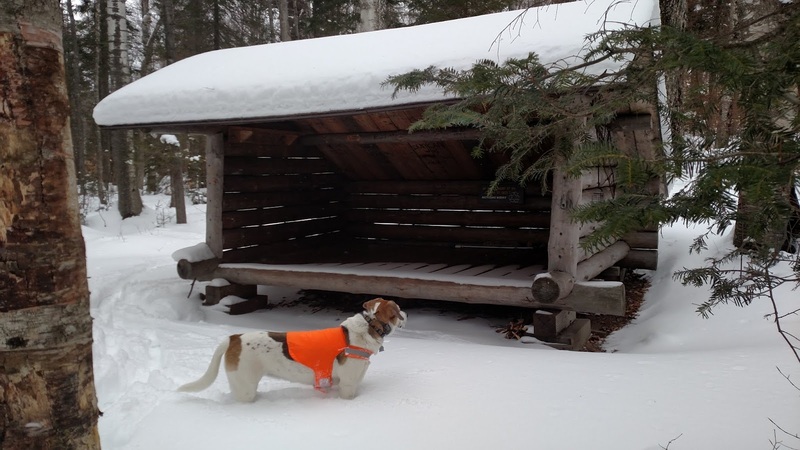 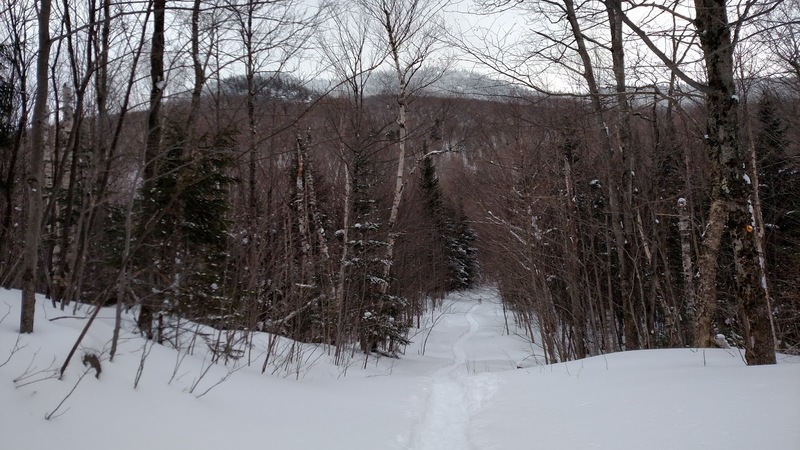 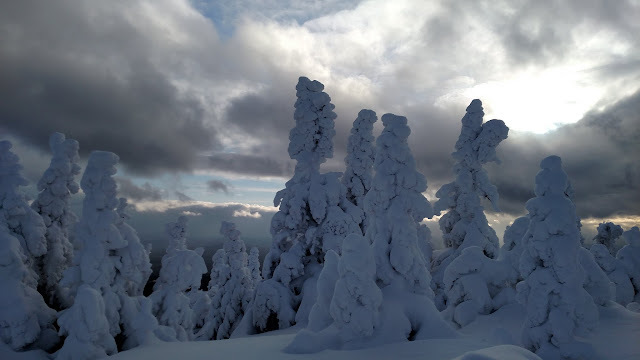 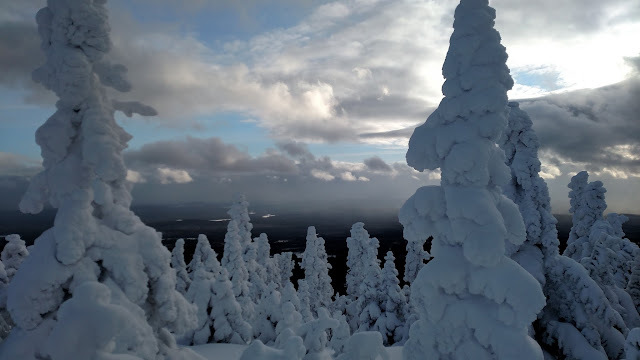 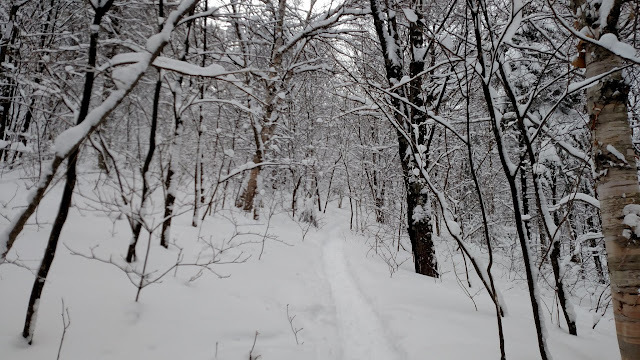 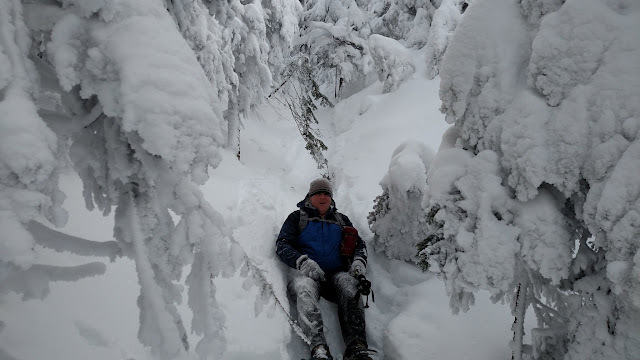 There was plenty of powder in the woods and the beginning part of the trail had been broken by one snowshoe track and one ski track. 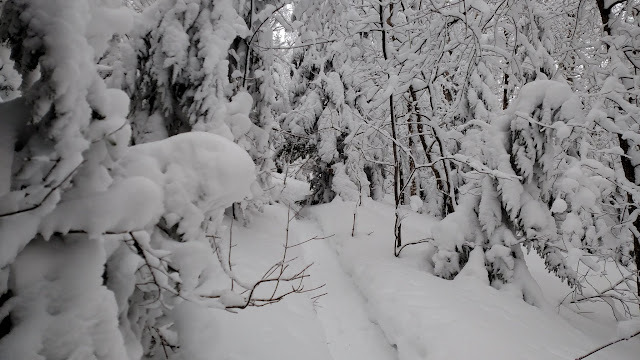 The ski track ended after a couple miles leaving a sole powdery snowshoe track in front of me. 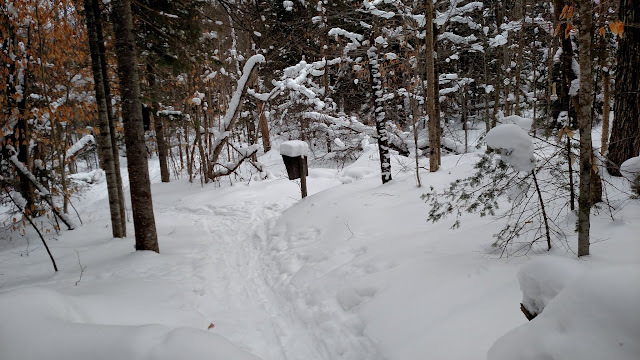 This trail has a drainage that runs through it about halfway to the lean-to. 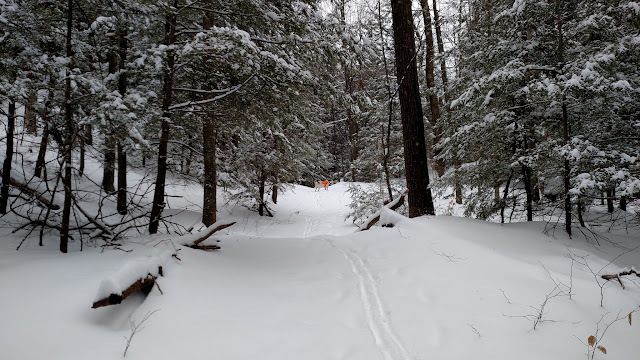 There needs to be an abundance of snow and some cold weather to allow this route to be skiable, otherwise you have to ski off the trail to find ways to cross the drainage. 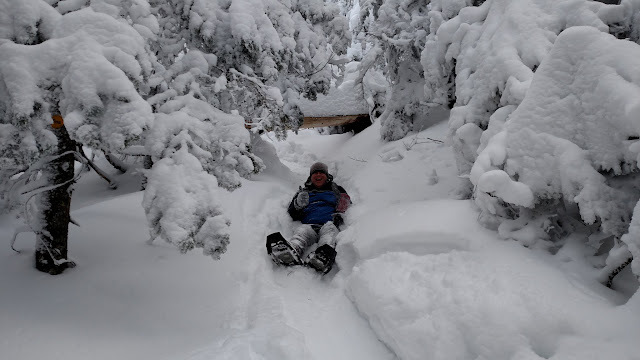 There were no issues today. 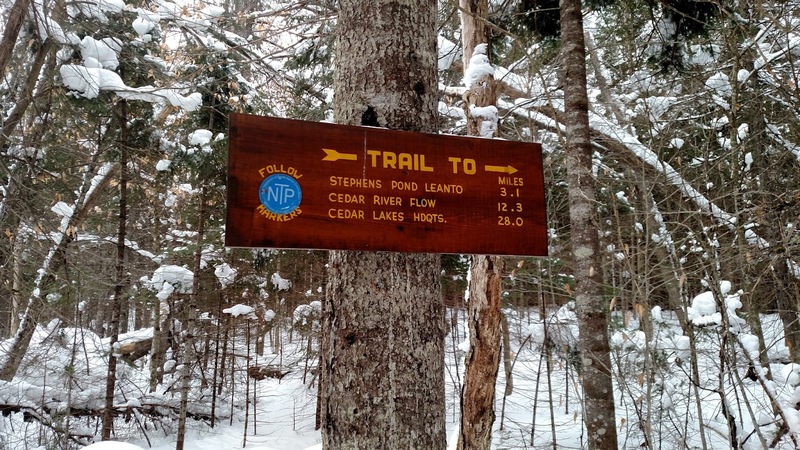 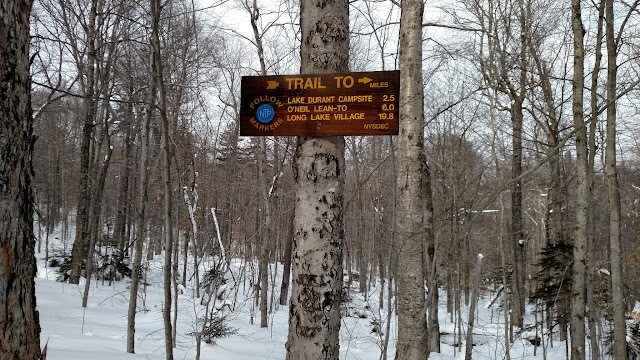 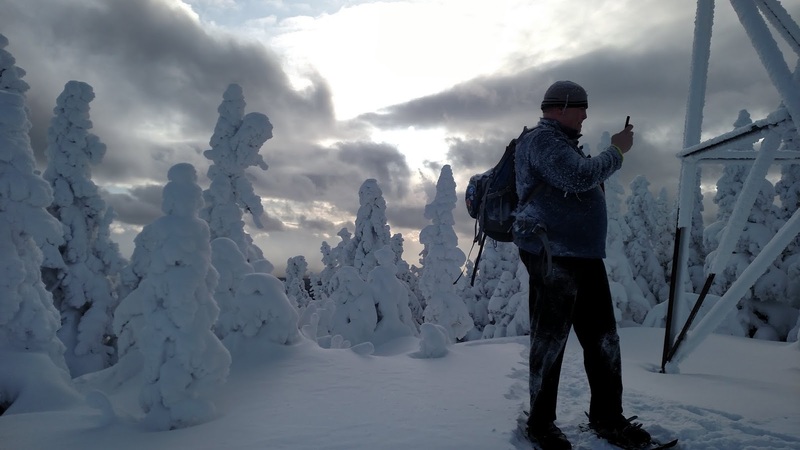 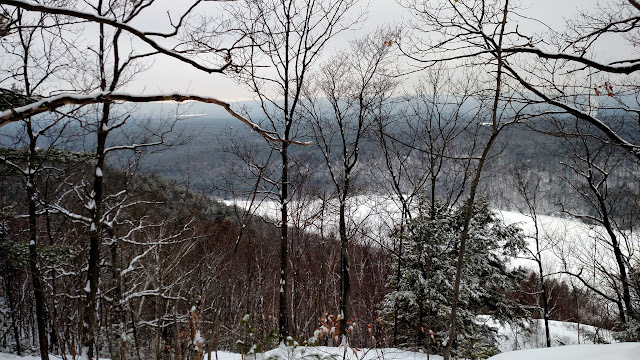 When I reached the trail junction, the snowshoe tracks went left towards Stephens Pond and I now had virgin snow in front of me for the final mile to Cascade Pond. 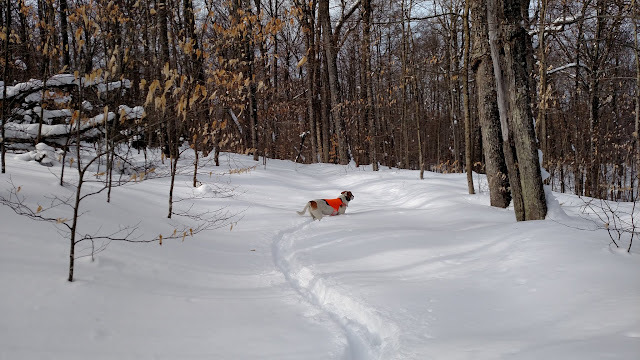 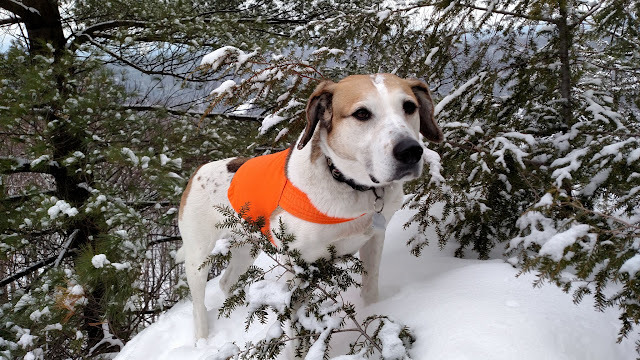 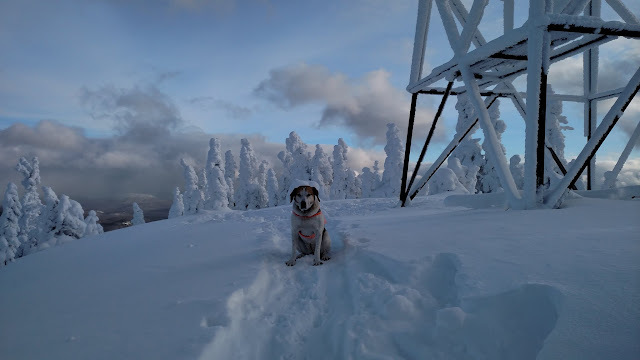 Rev did her best to break trail, but it wasn't necessary, the trail was mostly level and a foot of light powder was not an obstacle. Approaching Cascade Pond (seen on left). I reached the lean-to after 90 minutes. I was intending to stop there for a food break, but there was a brisk wind blowing right into the lean-to so I opted to wait for the to stop at the sheltered Stephens Pond lean-to. Leaving Cascade Pond lean-to. 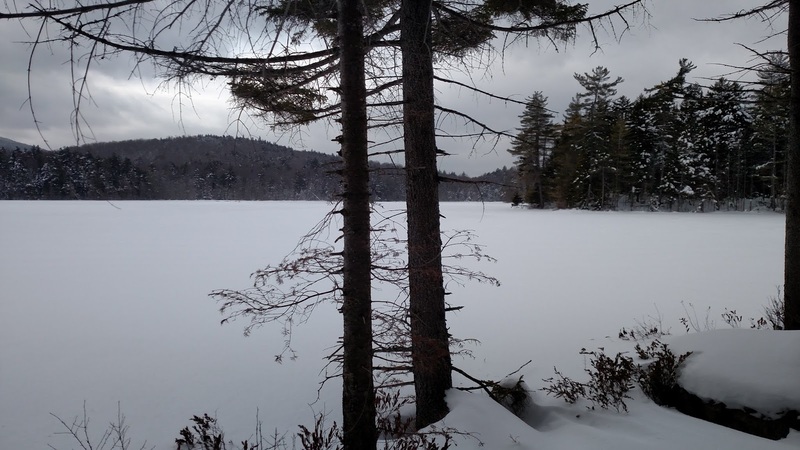 The pond is on the right. 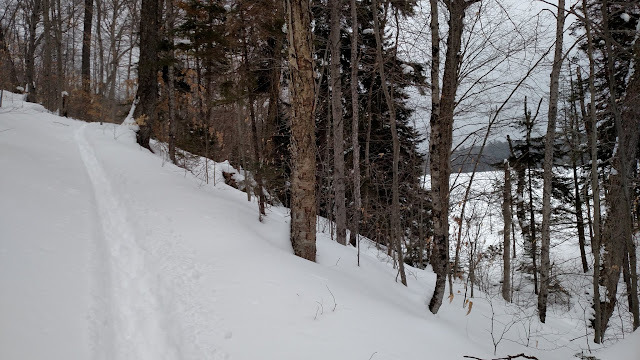 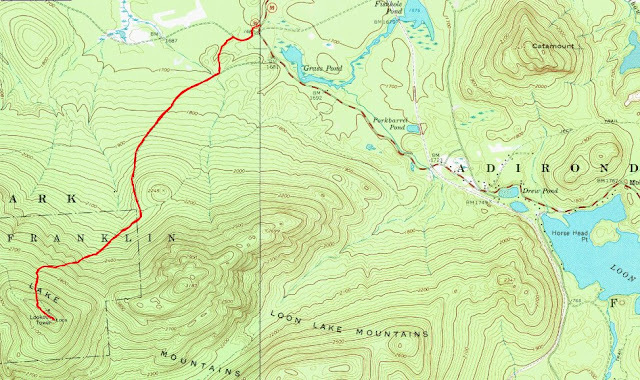 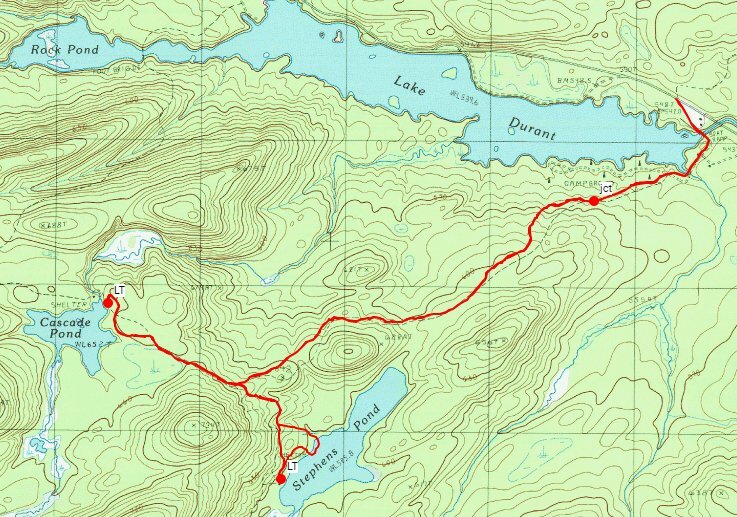 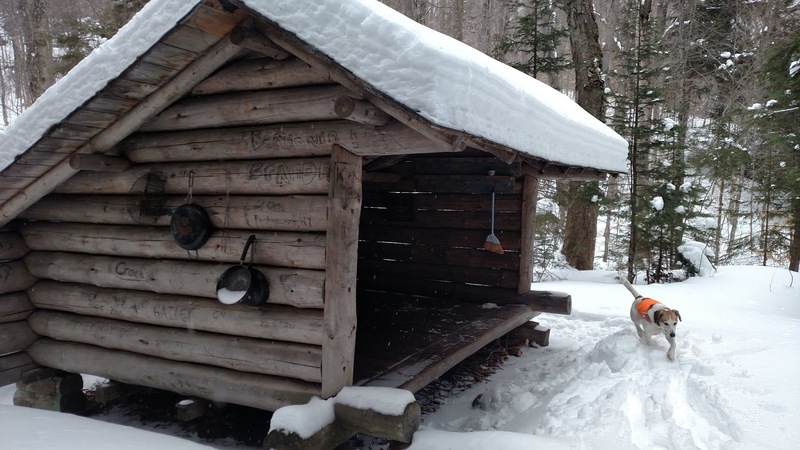 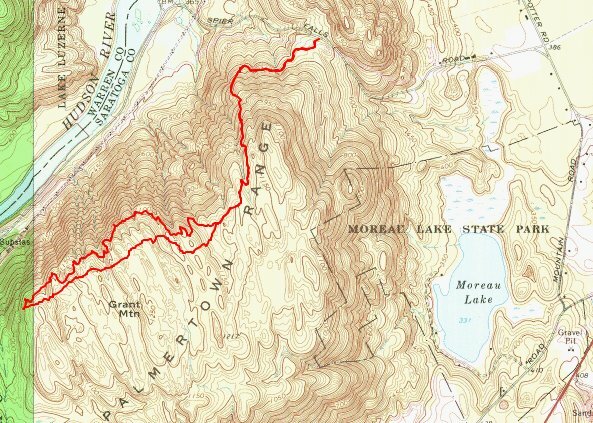 I skied back to the junction, then followed the trail (and snowshoe track again) to the Stephens Pond lean-to. 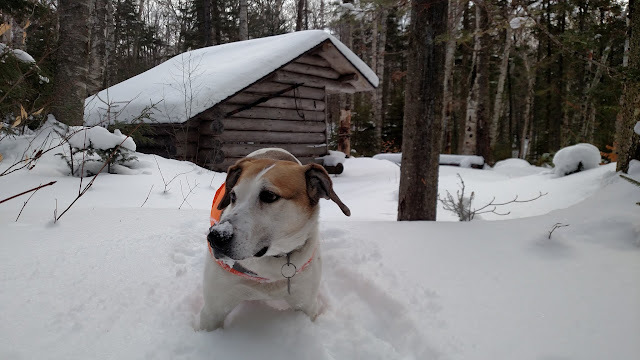 Rev and I took a break there. The ski back was quick, following my track and the downhill descent.